Yes, we’ve all done it- something stupid or thoughtless that requires an apology. How do we craft the perfect apology? An effective apology is both a Science and an Art. The science is basically the formula- what ingredients to combine under the right circumstances to produce the perfect reaction; that is to be forgiven. The art is in how you apply the science- how you actually deliver the apology. When you combine the science and art of an apology you inevitably get the perfect apology. There are two basic ways to deliver apologies. You can apologize in writing or verbally. In both cases you need to think through the apology to make sure that all the ingredients are present. There are many variations in both written and verbal apologies but keep in mind these two key points when thinking about how to apologize. 1. 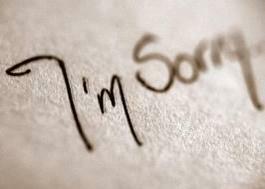 A written apology gives the recipient the time to think about the situation and your apology, before responding. 2. A verbal apology requires that you be prepared for the conversation that will follow, based on the recipient’s reaction whether it is positive or negative. So be prepared to think on your feet! Think about a favorite song that you share and how you can bring that into your apology or offer it as a gift, but remember to relate the song to the situation by framing it within a traditional apology. Perhaps it’s a song you were dancing to on your first date, or one you were both listening to on a memorable vacation, or the music that was playing on the radio when you had the fight. If it’s relevant in some important way to your relationship or the situation then the addition of music or lyrics will likely enhance your apology. Relevance is a key to success when thinking about effective ways to say “I’m sorry”. DO take the time to reflect on what you did wrong-and then take a little more time to reflect on what you did wrong. DO use words that are very clear and accurately convey your thoughts and sentiments. Be absolutely honest and show true sincerity when apologizing. DON’T try to evoke sympathy for yourself as part of the apology. Avoid ALL qualifiers and hidden messages that might imply sharing responsibility for the problem/mistake-NEVER share the blame. And lastly- NEVER use the word BUT when giving an apology. Try these tips the next time you need to give an apology, and see what a difference it makes.